Action - A bet or player's turn to go in a game of poker. Action Player - A bettor who always makes large bets. All-in (Poker) - Betting all a player's chips in poker. American Roulette - A roulette variation with two zero slots instead of one (0 and 00). Also see European Roulette. Ante (Poker) - A forced bet for all players before action starts. Any craps (Craps) - A bet placed totaling 2, 3, or 12. Any seven (Craps) - A bet placed on any 7. Bad beat (Poker) - An unlucky loss against the odds. Banker - A dealer or player who books action of other bettors in card games. Bankroll - Funds available to gamble with. Big Blind (Poker) - Large forced bet posted before action starts. Blind (Poker) - A forced bet placed before cards are dealt. Bluff (Poker) - A bet or raise without the best hand to force a fold. Board (Poker) - Five shared community cards in Texas Hold'em, a popular poker game named after the famous USA state. Bottom pair (Poker) - A pair including a hole card and lowest community card. Bounty (Poker) - Cash awarded for knocking out another player in a tournament. Bubble (Poker) - A player knocked out one place before the money prizes start. Burn (Poker) - Discarded card before flop, turn and river are dealt. Button (Poker) - Mark showing who is in Seat 1 and is last to act. Buy-in - Money needed to enter a gambling tournament. Call (Poker) - Match another player's bet. Calling station (Poker) - Player who matches majority of bets. Cap - Maximum bet allowed. Card counting (Blackjack) - Tracking the percentage of high and low cards emerging from decks in order to make bigger winnings. Cash Game - A poker game with fixed blinds and unlimited rebuys. Casino - An online site offering a suite of table games and slots to United States players. Chasing Losses - Increasing your bets as you lose in order to make bigger wins and cover your losses. Chips - Counters used to track a player's stack. Comp - Free cash or bonuses as reward for gambling. Continuation bet (Poker) - Wager made after the flop by the initial raiser. Copy (Pai-gow) - Same two or five-card hand. Credit (Video Poker) - Money already won but not yet cashed out. Croupier (Baccarat, Blackjack, Roulette) – Another word for Dealer. Cut - Splitting deck of cards after shuffling. Dealer - Croupier in a casino or the poker player sitting in the first seat. Deposit - Transfer of money to online gambling or poker account. Deuce - The 2 card. Double down (Blackjack) - Doubling an original bet in order to receive one extra card. Double Zero - The 38th pocket on an American Roulette wheel (00). 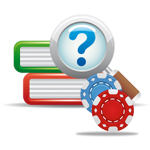 Edge – A player's or casino's gambling advantage. Encryption - Software used by online casino to protect financial transactions. En Prison - An insurance bet found in French Roulette which lets you win half your stake back in the event of the single zero (0) coming up. European Roulette - A popular form of roulette featuring just one green zero slot (0). E-wallet - Online bank account to manage transactions, especially for gambling sites. First base (Blackjack) - First position dealt to far left of dealer. Fish (Poker) - Bad player who bets on too many starting hands and calls bad bets. Fifth street (Poker) - River card. Flop (Poker) - The first three community cards dealt on the board. Flush (Poker) - A poker hand consisting of cards all the same suit in poker. Fold (Poker) - Throwing away a hand into the muck. Foul (Pai-Gow) - A lost hand when a two-card hand is set higher than five-card hand. Freeroll (Poker) - A poker tournament free to enter. Freezeout (Poker) - A poker game without a rebuy option. French Roulette - A variant of European Roulette featuring two insurance bets: La Partage and En Prison. Full house (Poker) - A hand consisting of three of a kind plus a pair. Handicap - An advantage or disadvantage given to a team by a sportsbetting site. Heads-up - A poker game between two players only, or a tournament that has whittled down to two players. High Roller - A player who bets large amounts consistently. Hit (Blackjack) - A request for another card. Hole card (Blackjack) - A dealer's face-down card. Hole cards (Poker) - Card/cards dealt face down to player, which only they can see. House - A casino or gaming establishment. House Edge - The disparity between the actual odds and the casino's payout on an outcome. Inside bet (Roulette) - A bet place on a number or small combination of numbers. Insurance (Blackjack) - An extra bet protecting player against dealer hitting blackjack. Live Dealer - An online game where players can bet against a human croupier standing at a real roulette wheel or dealing real blackjack cards. La Partage - An insurance bet in French Roulette which allows players to win half their stake back if the single zero appears. Lobby - Online casino or poker homepage with all games and payment tabs listed. Martingale - A betting system where you double your bet after each losing spin or bet. MTT (Poker) - Multi-Table Tournament; a tournament with two or more tables of players. Muck (Poker) - Area on the table where discarded cards go. Multilines (Sportsbetting) - Betting on more than one game or outcome at a time. Natural (Blackjack, Baccarat) - A player dealt a winning hand. Odds - Player's probability of winning or losing. Outside bets (roulette) - Betting 12 or 18 numbers, Red/Black or Odd/Even. Parlay (Sportsbetting) - An accumulating bet across multiple games. Payline (Slots) - A line on which symbols must land for a win. Picture cards - Jack, Queen, King and Ace. Play the board (Poker) - Player uses five community cards to make a hand. Pocket pair - A pair of matching hole cards in poker. Position (Poker) - Betting order in poker(the term is the same at USA and global sites). Point (Craps) - Number established on the come-out roll. Post - To place a bet. Premier Roulette Diamond Edition - An online version of roulette featuring four colors as opposed to just red and black. It's available at many United States casinos. Progressive Jackpot - A slots jackpot pooled from wagers across all casinos. 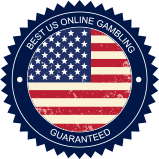 Players from the USA and around the world feed the same jackpot, which makes it grow bigger, faster. Punto Banco - A form of Baccarat. Push (Blackjack) - A tie hand between the croupier and the player. Push (Poker) - To bet or raise all-in. Random Number Generator (RNG) - Software used by online casinos and poker sites to ensure fair game. River Card (Poker) - Fifth and final community card. Satellite (Poker) - A tournament awarding entry into larger live or online tournament. Set (Poker) - Three of a kind including two hole cards. Set (Pai-Gow) - Separating hands into two-card and five-card hands. Show (Blackjack) - Box that holds and dispenses cards. Single Zero Roulette - See European Roulette. Small Blind (Poker) - A small forced bet in poker before action starts. Soft hand (Blackjack) – A hand containing an ace counted as one or 11. Stack – A column of chips. Stand (Blackjack) – Turning down more cards from the dealer. Systems - Strategies used by gamblers to increase their chances of winning. Tilt - Losing concentration due to bad luck and making poor decisions. Top pair (Poker) - A pair consisting of a player's hole card and the highest community card. Trips (Poker) - A three of a kind including only one hole card. Turn (Poker) - The fourth community card. Under the gun (Poker) - The first player to act after the big blind (Seat 4). Up card (Blackjack) - A dealer's face-up card. Value bet - A bet made to induce a call. VIP - A big bettor or high roller. Also see Whale. Welcome Bonus - Promotion by online casino which matches first deposit. Whale - A high roller. Wheel - Used in roulette. Contains 37 or 38 slots. Wild card - A joker or other card used as substitute to make winning hand. Zero - The 37th slot on a European Roulette wheel.